This post is very, very serious. Transcription should be. It needs to be able to communicate the spoken word for others to understand. However, sometimes we think we know what we wrote, put it in our document, then rereading see that it was a mistake. Hopefully WE catch that before someone else (it doesn't always happen with me). So here are some funny transcription errors I think you'll enjoy. This will also show you that if you make mistakes, you aren't the only one. 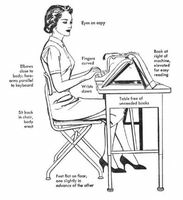 Another picture from a typewriting book.